Eric Genazia and Jeremy Wells wanted to find men’s watches that never had to come off. And they really meant never. The guys were searching for durable, good-looking watches that wouldn’t break the bank. When they came up empty, they began designing their own. 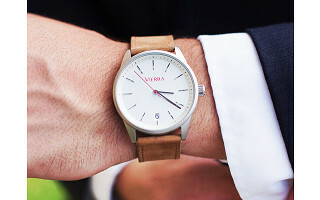 Their Vierra watches look sharp and are built to be worn wherever life takes you, from a surfboard to the morning commute. Eric and Jeremy chose strong materials for the bands—stainless steel, genuine leather, and silicone rubber—to suit different tastes and to lend a clean, minimal look that feels, well, timeless. Each watch is waterproof with a shatterproof crystal face. Should you somehow manage to still break it (Hang-gliding? Biking? Kid tried to flush it down the toilet? ), no sweat. They proudly back each watch with a lifetime guarantee. So hit the boardroom . . . or the slopes with a watch that doesn’t sacrifice style to keep up with you. Hello everyone! 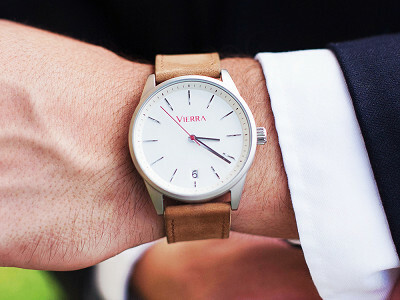 I'm proud to introduce Vierra Watches to The Grommet. I'd be happy to answer any questions you have! You do realize that your model is wearing it upside down, right? Have your model wear the watch the right way and take the photograph with the sleeve on the left, Marketing Genius. Hi David, we've done that shot before and didn't want to replicate it. It was more of a creative decision to have it as is. We encourage you to wear it the correct way. David has the solution. The pose you chose for your model is distracting for people who notice details (and isn't that your target audience?) Your answer sounds like a lazy cop out. If this is how you take care of details I certainly won't be buying one. Sorry. Hi Donna, my answer is the reality of the situation. We made the decision to show the watch in a way you could read the company name. That was the detail we felt was most important in promoting Vierra. You better believe we will have David's suggestion in the back of our mind for the next watch photo shoot we do. Different David....but I'm sort of with the other David...I can't get over the watch being backwards. I even searched online quick to see how other watch companies showed their watches, and they're all shown properly. I noticed it immediately and frankly it's maddening. Looks like a pretty decent watch and a fair price, but I can't get past it. I'm even in the market for a new watch in this style & price, but I doubt I'll be trying this one for that very reason. Credibility lost! It's like a model wearing a tee shirt backwards because the shirt had a neat logo on the back! Sad people are getting so hung up on a picture. You realize you don't have to wear it that way? LOL. It's not that serious, and to say you won't purchase simply based on that or their reasoning is a bit immature. Great looking watch! Are the leather bands waterproof as well? I really love the look and the Made in USA part! Is the watch certified as a chronometer? @Kimberly Amen. Still bold, but less bulky. You guys make great points! We have a few ladies that like the "boy friend" style watch so they have actually purchased Vierra Watches for themselves but we will definitely look into making something a little smaller for the ladies - thanks for your feedback!! @Eric Please make a smaller version for women. I am tired of replacing watches. Many thanks for your consideration! We will get right on it!! We have had a lot of desire for a ladies version of our watches so we will begin developing that idea - thanks for your feedback!! Nice looking watches, but no specifications. What are the dimensions? Water resistant to what depth? What's the crystal made of? What kind of action do you use, and where is it made? Hi Bruce, you can find all of that information by clicking on the "Buy" button on any of the styles under the video. @Mike biggest pet peeve of mine, I've mentioned this before, and you have answered this a gabillion times. a simple format change would finally end the frustration by a small header: "click here for details", or simply give specs on the first page. I really think it deters your sales with so many folks having the same problem! ANY problem with site navigation will stop busy shoppers from purchasing? Hi Christopher, it's one of the biggest pieces of feedback we get and I promise you it is not falling on deaf ears. Unfortunately, it's an issue without a quick, easy solution, but it is one we are working on ways to improve. The last thing we want is confusing people on their way to buy a product. Water Resistance: 10 ATM/100m/330ft. Rated for swimming & surfing. @Eric AWESOME!! Where can the bands be purchased separately? I could not find that anywhere on here. We will get that option added today! Just a note the silicone and leather are very easy to change out - the metal bands are a little more difficult. They're made in Japan. Watches originate based on their quartz. We mistakenly put made in the USA but have fixed it to reflect the correct info. If you position the hand with the thumb down, you can display the watch correctly. Made in USA or made in Japan? Promo says USA, specs say Japan. I'm hard on watches and am wondering if the black metal band is scratch and chip resistant. @Eric Sounds good but one more question before I buy - It is larger than I am used to - does 1.75" include the stem? Do you have any intention to branch out into women's watches? The same clean look with a smaller face would be great. 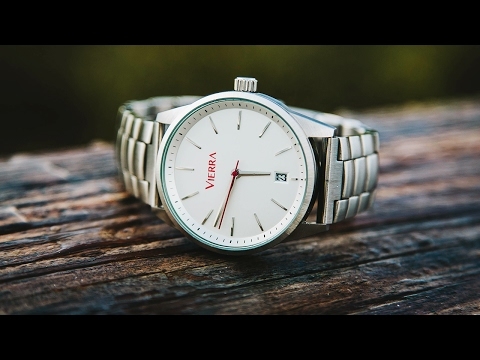 We have a few ladies that like the "boy friend" style watch so they have actually purchased Vierra Watches for themselves but we will definitely look into making something a little smaller for the ladies - thanks for your feedback!! Confused about manufacturing origins. The main description says Made in the USA, but the details under the leather watch said Made in Japan. Which is correct? Also, I'd enjoy seeing the diameter and thickness in metric (mm), not just inches, as metric seems more common for watches. Thanks. Hi, The description says made in the USA, but further down it says made in Japan, so which is it? Also, what is the power source for this watch? They are made in Japan, Katrina. It was our mistake to put made in the USA. The leather band page shows a wrist shot of a white watchface with gold tone hands and hour markings. Is there a white/gold combination, or only the white-with-black markings? Hi, Eric. The description says the band is 3" deep and adjustable, but it doesn't really give a length range. (Saying it's 3" deep is kind of like trying to buy a pair of slacks that say the waist is 14" deep. Lol!) My husband has a big wrist and I can never find a watch that fits him. If it doesn't fit depending on the model you order (leather or silicone) we can source extra long bands for you! the watch is 11" long so it would be pretty close! If it doesn't fit depending on the model you order (leather or silicone) we can source extra long bands for you! Is your date setting smart enough to respond to the month of February? @Kenneth ... and, is it battery powered or wound spring? Will you be making these for women? We love elegance and simplicity also. We've actually seen in fashion trends that a lot of ladies are liking bigger faced watches these days. Our watch fits most wrist sizes comfortably without being too bulky. On women the watch looks bold yet not overly done. However a lot of ladies do like the traditional smaller faces so we are going to start developing a womens line as well. Thanks for your feedback!! Confirm this watch has a BATTERY quartz movement. Do you lifetime warranty the battery? Also what service (every 5 years) is required and is it covered under the Lifetime Warranty? Last question - Is the Black Metal watchband also covered by warranty? The watch is battery powered and does have a quartz movement. The battery is not covered by the lifetime warranty but the black metal band is. If any thing breaks or becomes defective we will cover it. Now, design one for women!? there needs to be a picture of the clasps on the site for each watch - close-up and laid out flat. Lose the picture of the outside of the boxes - what's the point? Photos of the outside of the boxes give you an idea of the watch's packaging, Beth. We'll see if we can get those photos up. Great feedback Beth we will take that into consideration! 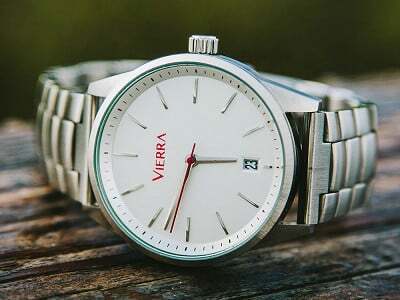 Eric, please advise if you and Jeremy are the importers of record for the Vierra brand and if the complete watch( watch head, strap and box) are all imported from Japan, country of origin for the movement as indicated. Also, please provide the name of the company doing the fulfillment and providing the guarantee as I understand Grommet is the product launch company. All the best!! 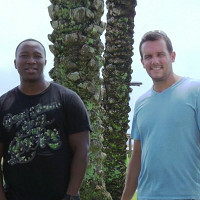 Eric and I are the founders of Vierra Watches which is based in the US. We do all product design and then source our parts and pieces (watch heads, straps, etc ) from japan. We assemble the watches in our various locations (VA, FL, TX) based on demand and ship them out from the US. We have partnered with Grommet to provide their awesome customer base an opportunity to check out our product. Hope this answers all of your questions! Attractive watch. What sort of clasp is on the metal bracelet? Deployment clasp? Any way to make a temporary adjustment in bracelet length to accommodate a wet suit (for off-season surfing)? Does the movement include a hacking mechanism (to preserve battery life and to allow for synchronization with a time standard)? Does the crown screw onto the case (to improve water resistance and to prevent accidental resetting of the time/date)? I understand that you are not making a watch that is suitable for scuba diving. However, some of us have active lifestyles that require a pretty hearty watch in order for it to be something that "never had to come off". Eric Genazia and Jeremy Wells wanted to find men’s watches that never had to come off. And they really meant never. The guys were searching for durable, good-looking watches that wouldn’t break the bank. When they came up empty, they began designing their own. 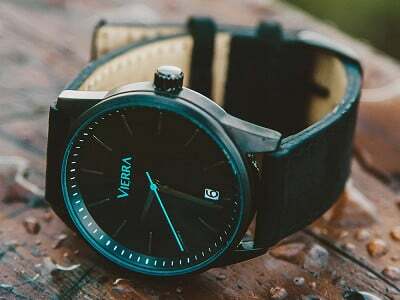 Their Vierra watches look sharp and are built to be worn wherever life takes you, from a surfboard to the morning commute. Eric and Jeremy chose strong materials for the bands—stainless steel, genuine leather, and silicone rubber—to suit different tastes and to lend a clean, minimal look that feels, well, timeless.